by Neil Hayes Author · John Madden Author of introduction, etc. Revised and updated edition of the book to accompany the major motion picture directed by Thomas Carter and starring Jim Caviezel, Alexander Ludwig, Laura Dern, and Clancy Brown. This insider's account of the greatest winning streak in sports history brings to life the tragedies, triumphs, and unforgettable characters that inspired the major motion picture. Neil Hayes takes readers behind the scenes at De La Salle High School, where coaching legend Bob Ladouceur led his football team to a historic 13-year run of consecutive wins. 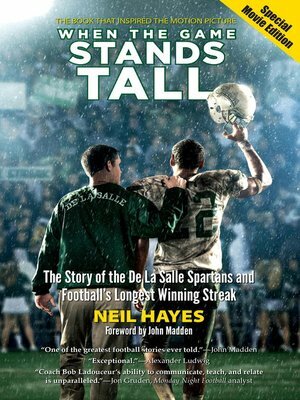 A coming-of-age saga as well as an exciting sports story, When the Game Stands Tall provides a deft portrait of the enigmatic and visionary coach who instills in his players a discipline, commitment, and dedication to doing one's best that endure well beyond high school. This latest revised edition takes readers onto the film set for an introduction to the movie-making process, and includes a full-color insert of scenes from the movie, an afterword updating storylines of many of the memorable characters, and details of Ladouceur's final year as head coach. As the story opens, the 2002 team, guardians of The Streak, is shaping up to be the most vulnerable in years. How the coaches and the players pull together throughout a difficult and challenging season to ultimately triumph is the thread of the book, with alternating chapters providing historical background on the school, past teams, stand-out players, and the dedicated coaching staff. Known and respected throughout the ranks of American football, the quiet and unassuming Ladouceur is among this country's all-time coaching greats, a man who has helped to define excellence in sports and mentorship. The book affords an inside look at the training techniques, off-season conditioning programs, scouting habits, and practice plans that produced such an outstanding team. It also introduces a cast of unforgettable characters such as Dan Shaughnessy of Salesian HS, "a fierce competitor who stormed up and down the sideline and swore more than a Catholic school coach should"; Brother Laurence, a much-loved teacher at De La Salle; Coach Eidson, a.k.a. "Cobra," and others. The weaving in of these characters illuminates the nature of the competition and says much about the spirit of De La Salle and the culture Lad has created.